Heat oven to 375°F. In 1-quart saucepan, stir together refried beans, 2 tablespoons of the cilantro and 2 tablespoons of the onions. Cook over low heat 4 minutes, stirring occasionally, until thoroughly heated. Place chips in single layer in 15x10x1-inch pan. Dollop bean mixture over chips; sprinkle with cheese. Bake 4 minutes or until cheese is melted. 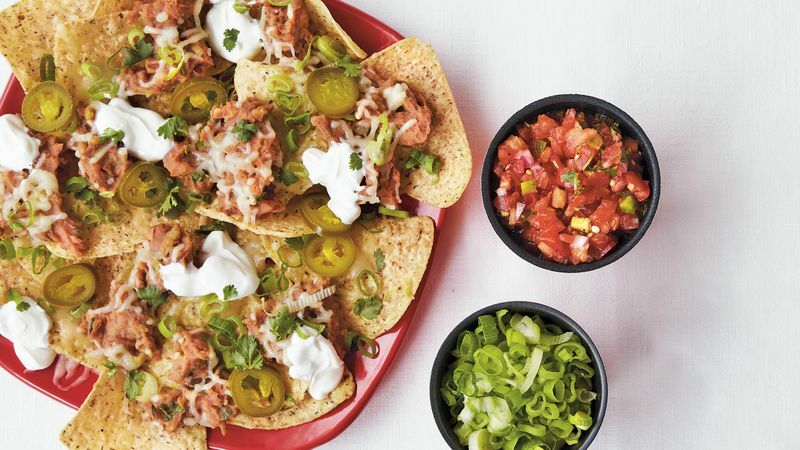 Dollop sour cream over nachos; sprinkle with remaining 2 tablespoons cilantro and 2 tablespoons onions. Garnish with pickled jalapeños. Serve with salsa.